Visits can be connected until the end time, and still can visit for the 20 minutes past the ending time. Example: Visit connects at 3:28 PM, Inmate/Visitor can visit for full 20 minutes ending at 3:48 PM which is in time for lock-up. Visitors must be at least 18 years of age or be accompanied by a parent or their legal guardian. Photo ID is required for all visitors 18 years of age and older. 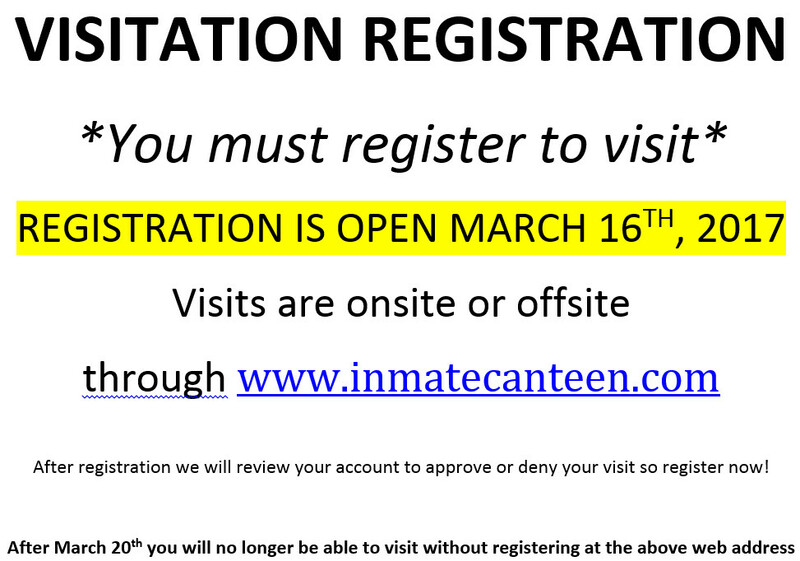 Register for visiting/email/texting online through www.inmatecanteen.com to be approved. Remote visiting is 39 cents per minute. Emails are 25 cents and texts are 13 cents each. During the visit do not be under the influence of alcohol or drugs. Be dressed appropriately. Any children not visiting an inmate need to be accompanied by an adult.